Come relax at beautiful Lake Gaston, North Carolina. Cozy, three-bedroom (1 queen, 4 twins), two-bath, rustic lakefront cottage located on widest part of one of the most beautiful coves on Lake Gaston (Poe Creek Cove, southeast quadrant of lake). Beautiful, newly painted, custom-built home has huge composite deck with partially covered deck area and gorgeous, ~180-degree, water frontage view from living room and master bedroom. Flat, grassy lot offers a very easy walk from house to dock. Huge dock (composite material, splinter-free) is perfect for fishing, swimming or tying up your own boat with a water depth of approximately eight to nine feet off dock. Check-in: 3pm, Check-out: 11am. Bring your boat, jet ski, water toys, sunscreen, and fishing poles for a fun, relaxing time with your family and friends. Shoreline of lot has nicely-built bulkhead offering for a well-kept, clean waterline. Ideal property for swimming and water activities. Owner to provide use of 2 new kayaks for renter's use. Boat rentals are available at local marinas. Cottage is very clean and nicely decorated with open living room and full wall glass doors for awesome views of the lake from inside. Home is located on quiet cul-de-sac of very nice, paved subdivision with convenient access (3.5 miles) to groceries, gas, restaurants, etc. Access to subdivision boat ramp can also be arranged for renters (key to lock required for gated access). No highway traffic heard from property - extremely quiet area. Convenient to I-85 and I-95. Click link below to email owner for additional pictures, info. Bedding: 1 Queen, 4 twin beds (sleeps 6 in bedrooms). NO SMOKING, NO PETS, 6 PEOPLE MAX, NO EXCEPTIONS. Lake Gaston is one of the truly superior lakes in the country, located in the piedmont area of northern NC and southern VA. It covers 20,300 acres, 34 miles long, and has over 350 miles of shoreline. The lake has very little water level fluctuation year round and has the highest water-quality rating in eastern USA (NC Stream Sanitation Commission, A2 rating). Lake Gaston is well stocked with game fish including striped and largemouth bass, bream, crappie, sunfish, and several varieties of catfish. Lake Gaston has an average depth of 40+ feet (~80+ ft. deep near eastern end at dam). What a nice, peaceful getaway! This home was lovely! 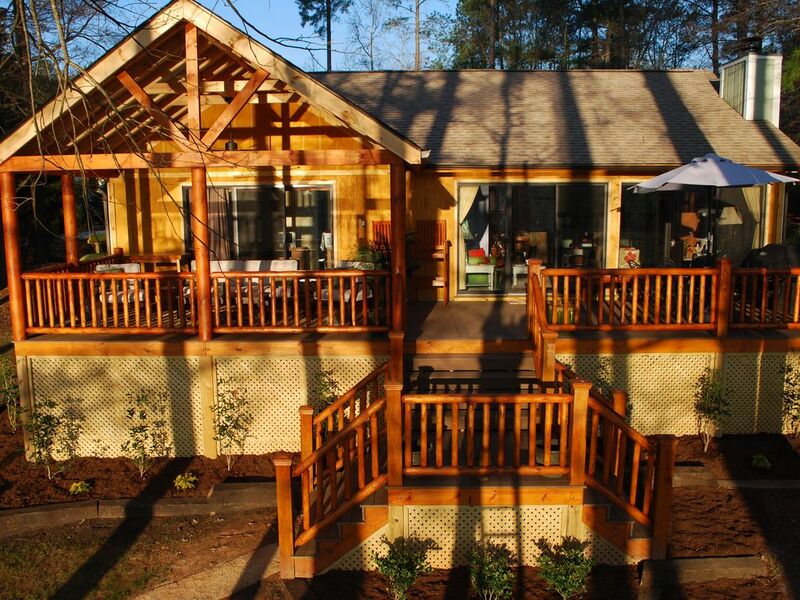 The lily pad was very cute and spacious and was located right on Lake Gaston. The kitchen was stocked with all of the necessities (pots, pans, dishes, utensils, etc) and there were plenty of sheets & towels to use. Our favorite part of this house was the view and the outside area. We enjoyed using the kayaks and the corn hole boards. It was a very nice, relaxing getaway. Stayed here for a girls weekend in September. We were excited to find the twin trundle beds were updated to 4 twin beds (although a bit too firm). The house was fantastic, right on the lake. No boats for us but we enjoyed swimming (the water was very warm), the splash pad, and brought a few of our own floats. We appreciated the lounge chairs on the dock and enjoyed watching the boats go by. Kitchen was well stocked and had all that we needed. Loved sitting on the deck in the mornings & evenings and catching sightings of the herons in the lake. Would love to see a fire pit added ;-) Great house, we had a fantastic time and can't wait to return. Beautiful property, perfect views and access to the lake and exactly as described. The cabin is well maintained and very clean. It has evening shade and morning sun on the lake side which was great. It's positioned in a deep enough spot of a cove that keeps the boat traffic down. We caught bass and catfish from the dock. The kids loved the swim mat and the kayaks. If you bring a boat, Washburn's Marina was relatively close by and a good spot for a breakfast sandwich, Ice cream and gas. Our boat was tied to the dock for the week and didn't get bounced around much. There are quite a few board games for downtime between passing showers. The living room is wall to wall with windows and gave a fantastic view. We would definitely choose this place again without question. Amazing Cottage from the Inside Out! The Lily Pad Cottage is just stunning on the inside as it is on the outside. The interior is colorful and full of life, it just gives off this vibrant vibe. The master bedroom has the best views ever, you’d wake up pull the curtain and you have this amazing view of the dock, the trees, the shoreline and the blue Heron that paid us a visit almost every day and stood gracefully on one leg in the morning mist! The little windows with the cute wooden shutters gave a nice touch to all the rooms and views of the fresh green lawn too. There is a room with a Hawaiian theme perfectly decorated, I don’t have kids yet, but I’m sure that this room would be every girl’s dream to stay in! We’re into fishing so we spent most of our time on the spacious comfortable dock that’s only a few feet away from the deck through a perfectly paved pathway with a very gentle slope. For those who like boating, this is the boaters heaven. We couldn’t fish during the day from all the boating with cheering teenagers and proud parents teaching their kids to water ski. It was fun to watch though! Then when it would get dark, it’s just one catfish after the other! We lost count! and tons of sunfish too before dark. Tom is the best to deal with, he was always accessible and helpful and was genuinely interested in making sure that everything was perfect for us during our stay. And he did make everything perfect! We’d come back to the Lily Pad and enjoy this beautiful experience again. We're just returned from The Best Vacation ever. This cottage was perfect for our family. The kayaks provided hours of fun. I loved sitting on the dock and watching boaters/jet skiers go by. We rented a boat for the week and loved every minute of riding "to the bridge" (Eaton Ferry) and beyond every day. I loved sitting on the covered deck for reading, we loved playing corn hole. Honestly, we loved every single thing about this visit to The Lily Pad on Lake Gaston and are already dreaming of staying there next year! We just returned from a week on Lake Gaston and had a wonderful time. Lake Gaston Cottage is on a perfect spot on the lake, it is down a really nice cove where is is quite and the water is always calm. The deck on the back of the house is heaven! You have sun if you want it but you also have shade with a ceiling fan. I spent my entire time outside. The house has everything you need and the owners are great to work with. If we ever go back we will spend our time at the cottage again. Note rental agreement contract for details on cancellation policy.